The Queen’s Temple was originally designed by James Gibbs and built during 1742-48. It was then called the Lady’s Temple as it was designed for Lady Cobham to entertain her friends. 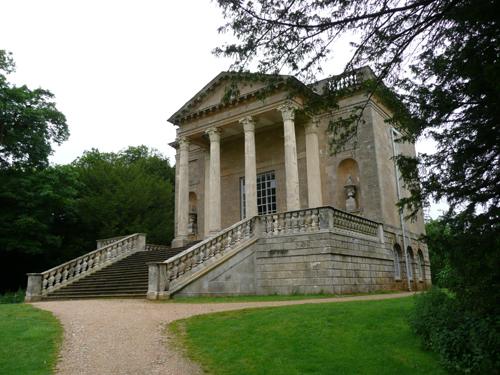 It was reworked in neoclassical style in the 1770s, when its south front acquired an imposing 3-bay Corinthian portico2 and the north front a projecting pedimented centre with curved Ionic portico. The architect was probably Thomas Pitt.3 The interior was remodeled in 1790 by Vincenzo Valdrè to commemorate George III’s recovery from madness with the help of scagliola columns and an elaborate plaster ceiling. Sleter’s ladies vanished from the walls and their places were taken by plaster reliefs, signed and dated by the sculptor Charles Peart, 1790. The temple was now renamed the Queen’s Temple in honour of Queen Charlotte after whom the building was renamed. The floor has a Roman tessellated pavement moved from Foscott Manor 1839-40. The pavilion is listed Grade I. 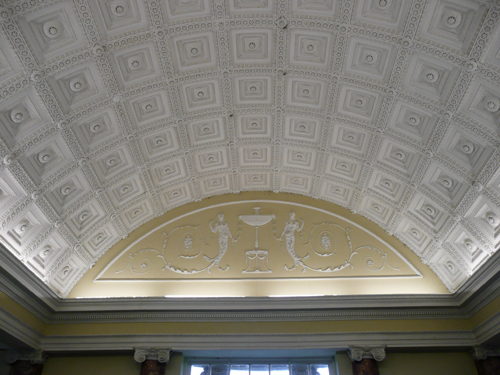 Ceiling. The design for which was taken from the Temple of Venus and Roma in Rome. The original work was called the Lady’s Temple, and is often ascribed to Kent; but it closely resembled a Gibbs building at Down Hall in Essex. Lord Cobham and his political friends had their habitable Temple of Friendship from 1739 onwards, and we can imagine Lady Cobham demanding one for her own amusement, not too far from the house, and with a south aspect. It was built on a vaulted basement, open from front to back. The upper room had mural decorations by Sleter, the Venetian, depicting ladies engaged on the one side in needlework and shell-work, and on the other in painting and making music. A central Venetian window to the south enjoyed much the same view that we see to-day. Mid-way on the left is the Gothic Temple by Gibbs, romantically peeping above trees, and at the far end of the vista, effectively “answering” us here, his Temple of Friendship. 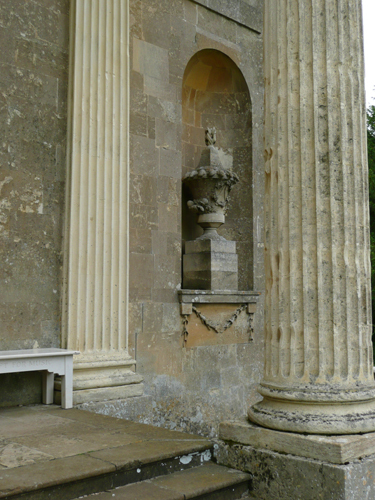 But, looked at from the far end, the original façade cannot have been much of a climax, and it may have been Pitt who supplied what was needed; the most handsome portico at Stowe, apart from the main south portico of the house. At the same time he refaced the temple very charmingly all round, with a fine flight of steps to the front. The flattened bow at the back, of 1778, may have been the design of Vincenzo Valdrè, who appeared at Stowe in about 1776. The interior was redecorated by Valdrè with pink scagliola columns and an elaborate plaster ceiling. Sleter’s ladies vanished from the walls and their places were taken by plaster reliefs, signed and dated by the sculptor Charles Peart, 1790. The temple was now renamed the Queen’s Temple in honour of Queen Charlotte, as a tribute to her Majesty’s devoted nursing of her husband, George III, during his serious illness of 1789. 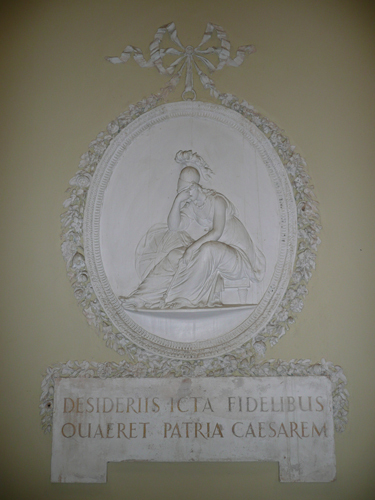 On the west wall, inside, a medallion shows Britannia dejected and with spear reversed. On the east wall she is sacrificing to Æsculapius, the God of Health. Four other delightful medallions represent — War; Navigation and Commerce; Agriculture and Manufacture; Religion, Justice, and Mercy. A Medallion of Britannia dejected, and with her spear reversed. Photomicrograph of Paint Layers on the lower Torus Moulding of a Pilaster. This shows early (shiny) dark stone-coloured layers and a later sanded one. The samples taken from the interior of the Queen’s Temple show clearly three significant periods of the building’s history – 1740s; 1790s and the twentieth century. Whilst many surfaces display five decorative schemes it appears that the lower mouldings on the columns/pilasters retain paint from the 1740s (eight schemes). 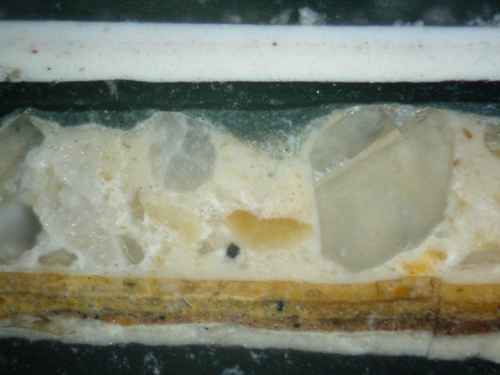 The photomicrograph above shows how these mouldings had been sanded6 at some time in the nineteenth century. Variations of stone colour predominated until the pre-War restoration when the walls were painted dark blue and black was introduced on the skirtings and column/pilaster bases. It seems that the scagliola columns were overpainted for the first time as part of the twentieth century restoration. 1 Source – John D. Tatter, Birmingham-Southern College. Michael Bevington. 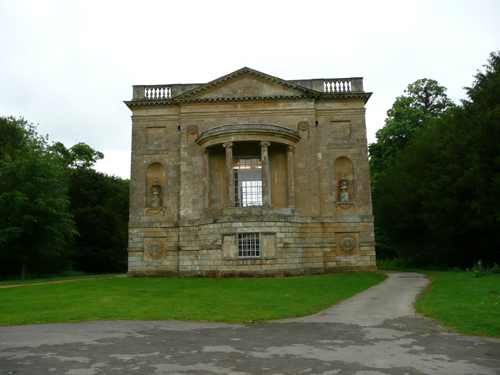 Stowe House. Paul Holberton Publishing. 2002. 2 Apparently based on the Maison Carrée. 3 Thomas Pitt, 1st Baron Camelford, was a politician and an amateur architect active in the eighteenth century. He was born at Boconnoc, Cornwall, and was a nephew of William Pitt the Elder. 4 Benton Seeley’s guidebook: ‘Stowe: A Description of the Magnificent House and Gardens of The Right Honourable Richard Grenville Temple, Earl Temple… Embellished with a General Plan of the Gardens, and also a separate Plan of each Building, with Perspective Views of the same.’1797 edition. It went through seventeen editions between 1744 and 1797. 5 John Martin Robinson, Temples of Delight: Stowe Landscape Gardens. The National Trust and George Philip, 1990. 6 Dry sand was strewn on the still-wet paint so that it dried with a stone-like texture. A later version can be seen here. Please note there is an error in footnote 3: Thomas Pitt the architect was the nephew of Pitt the Elder. Many thanks Brian. This has been changed.